I have this elaborate lifestyle fantasy. One aspect of my fantasy involves me, opening the fridge, revealing multiple brightly colored bottles filled to the brim with freshly squeezed juices. Every morning, I'd reach for a health tonic to commemorate the start of my day. In an effort to infuse my real life with the vision I have in my head, I visited a local juicer and inquired about the price of purchasing a week's worth of vegetable juice. Much to my dismay, the investment was around $10.00 a bottle. I could do it as a splurge but having fresh bottled juices on hand all the time wasn't cost effective long-term. The simple solution is that I need to become my own juicer. The inspiration came partially from Brittney Hampton and partly from Karrueche Tran. As you recall, Brittney let us in on her favorite lemon-ginger-apple tonic (a.ka. her "skinny tea"). A short while later, I caught a glimpse of Karrueche holding a small bottle of a "wellness shot" consisting of lemon, ginger, & cayenne. I quickly took a screenshot and saved the image for later reference. While reviewing my camera roll, I realized that I previously saved another image of Karrueche holding a similar bottle. Apparently, these little wellness tonics are part of her regular routine. 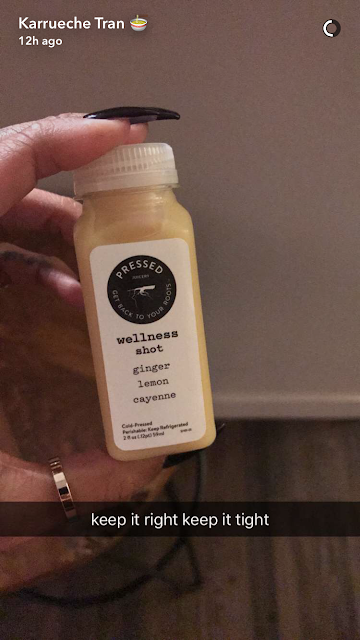 I can imagine Karrueche opening her fridge and seeing a neatly lined row of wellness shots ready for the taking. Her caption leads me to think that, like Brittney, Karrueche believes this ginger/lemon combination helps keep her figure "right and tight." Either I make the sacrifice and invest in premium priced bottled juices, or I can become my own juicer. Instead of making a small amount of ginger lemon water every morning, I'll purchase a set of empty juice bottles and whip up enough tonic to last a week. Right now, I'm debating between these cute little bottles or these which are made of glass. Over a year ago, I dabbled in prepping salads and it was amazing. I ate waaaaaay healthier and felt great! Having a fridge full of ready made salads took away the guess work and kept me from settling for unhealthy options. That's exactly why I want detox juices on hand and ready for consumption at all times. I'd love to eventually experiment with several variations such as lemon, ginger, coconut water. Or coconut water laced with chlorophyll drops. Let's not forget about aloe juice with its ability to help promote collagen production. And, of course, there will be a few vegetable-based juice in there as well. But the other combinations I mentioned have a longer shelf life. I can not wait to fill my fridge with these bottled juices. I have a smile on my face right now just thinking about it. I do think this is a great idea in theory, but theres some down sides. 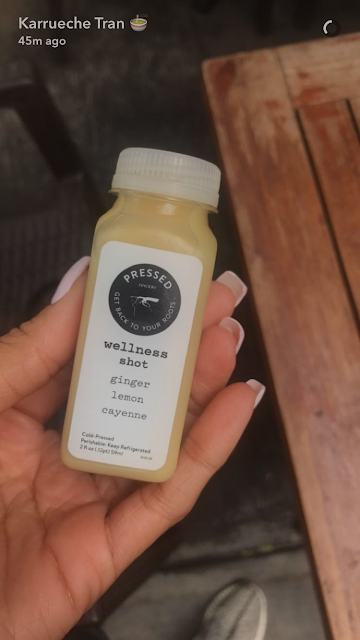 From my experience, the $10 juices do have the highest quality because they are likely cold-pressed which makes a huuuuge difference in quality. Most retail juicers are centrifugal, and many of the enzymes get destroyed in the process. Now I havent looked at retail juicers in many years, maybe people are buying cold press juicers for the home, Ive just never seen one. I do know that cold pressing is a slow process too.